Dodsworth, Eva H. and Nicholson, Andrew. Using Google Earth in Libraries: A Practical Guide for Librarians. Lanham, MD, 2015. 109 p. $65.00. Spatial technologies are of increasing interest to a wide breadth of researchers, educators, and students: Geography education and spatial literacy are now among the priorities for K-12 education. Incorporating data analysis and study of spatial-temporal patterns are becoming staples in higher education curriculum. Libraries, museums, and government agencies are employing more sophisticated user interfaces to share their data. 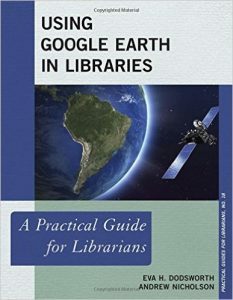 In Using Google Earth in Libraries: A Practical Guide for Librarians, authors Eva H. Dodsworth and Andrew Nicholson provide a thorough and timely introduction to the robust and freely available spatial application Google Earth. This work is a part of the Practical Guides for Librarians series edited by M. Sandra Wood, Librarian Emerita, Penn State University Libraries. Using Google Earth in Libraries fits well within the series with its objective to serve as “a guide to the Google Earth application[…]with an extra emphasis given to its role in education and research” (ix). By detailing a variety of use cases in libraries and education, the authors showcase the high demand for learning spatial technology. To answer this demand Dodsworth and Nicholson walk the reader through the application’s navigation and tools, before proceeding into step-by-step tutorials for creating maps, georeferencing imagery, and working with various file types. As the series description touts, this edition was written for librarians by librarians. Eva Dodsworth is the geospatial data services librarian at the University of Waterloo. She previously authored other guides to working with geospatial technology. Both Dodsworth, and co-author Andrew Nicholson, have significant experience teaching geospatial applications. Nicholson, the GIS/data librarian at the University of Toronto Mississauga, has worked extensively with faculty to develop spatial assignments for a range of curricula. Using Google Earth in Libraries is divided into five chapters. Chapter 1 describes the history and development of Google Earth, which not only helps the reader understand the application, but also the monetary and educational value of the tool which is offered without cost. The authors introduce the growing field of geographic information systems (GIS), which allow readers to contextualize Google Earth as a gateway into spatial technology and as a program that is used in high caliber academic research. Readers are not assumed to have background knowledge in GIS, and definitions of common acronyms and geospatial jargon are defined, often with call out boxes to draw attention to new concepts. It is in this chapter that readers are introduced to Google Earth’s interface, tools, and available data. At the conclusion of each chapter, references are provided for ease of reference. The second chapter discusses Google Earth as a resource management system employed by libraries. Not surprisingly, the application is commonly used as a “pathfinder,” allowing the discovery of material with geographic components. Other popular uses of the software discussed include: facilitating the distribution of digital resources, creating digital versions of air photos and paper maps, and utilizing open data. Dodsworth and Nicholson also use a portion of the chapter to discuss the differences of open data implementation between the United States and Canada, which serves to contextualize the difference in data access across the two countries. For librarians interested in exploring the possibilities of serving up a digital collection or creating a geographic index for a paper materials, this chapter contains numerous examples from academic libraries, museums, governments, and open community projects. In Chapter 3, the authors discuss approaches and resources available for incorporating Google Earth in the classroom. They begin by introducing the increasing ubiquity of geospatial technology in education and the power to enhance learning objectives by utilizing applications like Google Earth. A nationally recognized need for students to be active in their learning engagement and to develop spatial literacy (49) contextualizes the importance of incorporating geospatial applications. For learning in kindergarten through high school settings, examples of Google Earth being used in the classroom are described. Example assignments and tables of teaching resources are provided. For higher education, examples of implementing Google Earth in various fields of study are discussed. The chapter concludes with approaches for using the software in learning outcome assessments and a pedagogical recommendation which incorporates “scaffolding” geospatial education. A review of some more advanced Google Earth tools is given in Chapter 4. The chapter starts with a more in depth look at Keyhole Markup Language (KML), on which Google Earth file formats are based. Resources are provided for readers interested in creating custom KML files which allow for using animations, such as implementing a “time slider,” in Google Earth. Other resources and examples are provided for working with description balloons, dynamic placemarks, and moving between KML files and other formats. Advanced tools and menus explored include: georeferencing, making video tours, using Google Fusion tables, and exploring celestial and ocean features. The final chapter is the most “hands-on,” leading the reader through tutorials on map making, georeferencing imagery, creating paths, making tours, working with KML files and spreadsheets, and geocoding. Screen shots and call out boxes embedded in the tutorials help the reader accomplish each activity. The tutorials address core techniques of interest to librarians and educators looking to share collections or create learning aids. As with most print material describing technological applications, Using Google Earth in Libraries suggests some resources and workflows which have already become obsolete. For example, GeoCommons is described as “one of the best online geospatial data conversion and mapping service providers” (98). However, GeoCommons, produced by GeoIQ, was acquired in 2012 by Esri. Since Using Google Earth was published, the functionality of the previous GeoCommons website was gradually folded under the Esri platform. Unfortunately, these events render some of the information provided by Dodsworth and Nicholson out of date, in particular, a tutorial section in the final chapter. Luckily, the navigation of Google Earth remains true to the book’s description. The expansion of geospatial technology into the classroom, research, industry, and our personal lives is prompting librarians to become versed in these applications. Dodsworth and Nicholson’s practical guide is tailored to introducing librarians of varying GIS skill levels to Google Earth. While the book is geared toward beginners, experts can certainly benefit from this collection of detailed use cases and educational resources. Exploring the basic navigation presented in the introductory chapter and completing the tutorials at the conclusion of the volume will prepare readers with the tools necessary to begin designing their own projects.